One of Southampton’s tourist landmarks has just announced its 2013 sailing programme, ahead of a busy year that will mark its 25th anniversary ‘in preservation’. The SS Shieldhall, the largest steamship of her type still operational in Europe, was purchased by charity the Solent Steam Packet Limited in July 1988, and is maintained and manned entirely by volunteers. The 2013 programme sees the Shieldhall mark its anniversary by participating in a number of special events, including the Southampton Maritime Festival on the Bank Holiday Weekend 5-6 May, the ‘5 Cruise Ships’ gathering on Sat 8 June and Cowes Week Fireworks on Fri 9 August. New for 2013 will be the opportunity for passengers to enjoy taster two hour cruises of the Solent for just £12 per person (£6 children). Sunday 5 May, Southampton Maritime Festival – In steam alongside from 13.00-18.00. Guided tours available. No charge, donations welcome. Bank Holiday Monday 6 May, Southampton Maritime Festival – In steam alongside from 10.00-15.00. 2 hour cruise from 16.00-18.00. Tickets £12 available on day. Saturday 8 June – A 2 hour cruise to view ‘5 Cruise Ships’ (MSC Opera, Ventura, Celebrity Eclipse, Queen Mary 2 & Royal Princess). Depart 11.00, Return 13.00. Tickets £12 adults; £6 children. Saturday 8 June – A 2 hour family cruise to view the departure of ‘4 Cruise Ships’ (MSC Opera, Ventura, Celebrity Eclipse & Queen Mary 2). Depart 15.30, Return 17.30. Tickets £12 adults; £6 children. Sunday 9 June – Cruise and dine spectacular. Witness the departure of ‘4 Cruise Ships’ (Oriana, Queen Elizabeth, Silver Cloud & Royal Princess) and enjoy an inclusive 3 course meal. Limited to 60 passengers. Depart 13.00. Return 17.30. Tickets £60 adults, £45 children. Thursday 8 August – A lunch cruise to view the sights and sounds of Cowes Week. A fine 2 course sit down buffet lunch included. Limited to 60 passengers. Depart 11.00, Return 16.00. Tickets £60 adults, £45 children. Friday 9 August – Cruising the Solent to view Cowes Week yachting. Depart 11.00, Return 16.00. Tickets £30 adults; £15 children. Friday 9 August – Cowes Week Spectacular Fireworks Finale with ‘The Shieldhall Stompers Jazz Band’. Light suppers and snacks available on board. Depart 18.30, Return 23.59. Tickets £39 adults; £20 children. Saturday 11 August – Start of the Fastnet Race. See up to 300 yachts pass close to Hurst Castle. Depart 09.00, Return 16.00. Tickets £39 adults; £20 children. Saturday 17 August & Sunday 18 August – The Old Gaffers Jubilee Festival, Cowes. Depart 11.00, Return 16.00. Tickets £30 adults, £15 children. 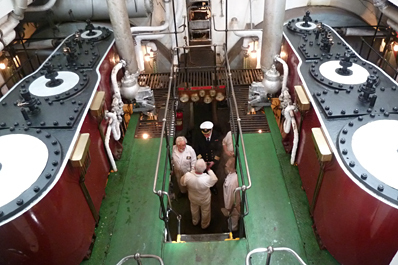 Saturday 7th September – Merchant Navy Day Excursion. A short service of remembrance and a wreath laying, for those that wish to do so. A day to remember. Depart 11.00, Return 16.00. Tickets £30 adults, £15 children.